I like to base almost everything I write on facts and if ever I throw my opinion in there I will state ‘in my opinion’. – Most of what people spend money and time concerning themselves with in nutrition and training will make less than 5% difference to the outcome. – Most coaches make people’s diets considerably harder than they need to be. It’s not your client that’s failing. It’s you. – Most people who take BCAAs as a supplement don’t need too….period. – If you work in a commercial facility and struggle to fill your diary it’s your product and service that’s wrong. NOT the type of client. – Quality of life doesn’t linearly go up as body fat goes down. 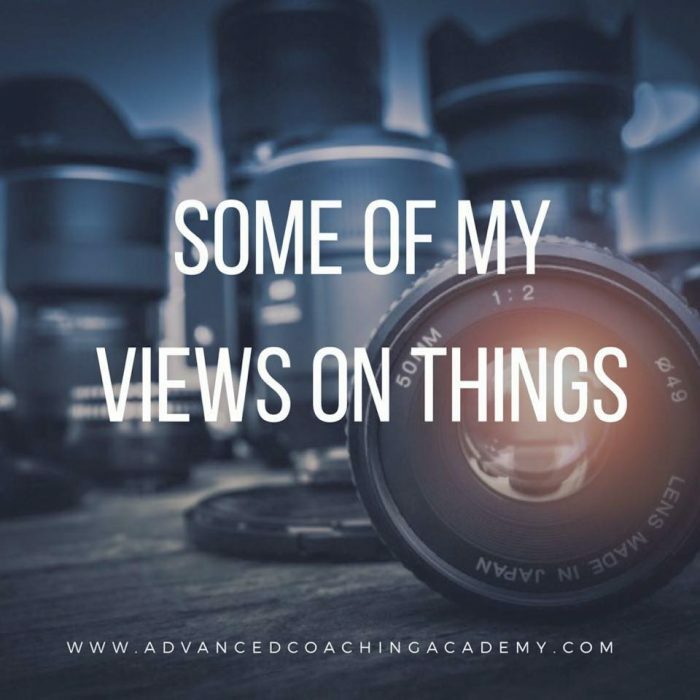 – Most coaches have no clue what their clients needs are. – Compliance is the number one thing that should be focused on in any training or nutritional regime. Sustainability is the second. – Those who fight the corner of HIIT did HIIT and it worked. Those who fight the corner of LISS did LISS and it worked. Those who have no opinion did both or neither. Both work, neither significantly more than the other. ……..the same can be said of fasted vs non fasted CV. There’s a significant amount of irony that people who claim to be ‘evidence based’ don’t experiment with their training or nutrition. Everyone’s got an opinion so form your own but just thought I’d share a bit of mine….